For a young boy growing up in the segregated south, a town drinking fountain becomes the source of an epiphany. It’s a scorching hot day, and going into town with Grandma is one of Michael’s favorite things. When the bus pulls up, they climb in and pay their fare, get out, walk to the back door, and climb in again. By the time they arrive in town, Michael’s throat is as dry as a bone, so he runs to the water fountain. But after a few sips, the warm, rusty water tastes bad. Why is the kid at the “Whites Only” fountain still drinking? Is his water clear and refreshingly cool? No matter how much trouble Michael might get into, he’s determined to find out for himself. 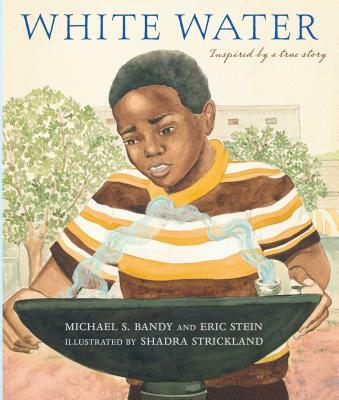 Based on a transformative experience co-author Michael Bandy had as a boy, this compelling story sheds light on the reality of segregation through a child’s eyes, while showing the powerful awareness that comes from daring to question the way things are. Michael S. Bandy caught the writing bug when his third-grade teacher surprised him with a set of Dr. Seuss books. He’s been writing plays, screenplays, and books ever since. He lives in Los Angeles and is involved in a number of children’s charities. Eric Stein has written for the children’s TV series Star Street and was a supervising producer on the animated special Defenders of Dynatron City. He is also on the dive team at the Aquarium of the Pacific in Long Beach, California, where he swims with sharks almost every weekend. Shadra Strickland is the illustrator of BIRD, for which she won the Ezra Jack Keats Award and the John Steptoe award, and OUR CHILDREN CAN SOAR, for which she won the NAACP Image Award. She lives in Atlanta, Georgia. From the seating on the bus to the two water fountains, this book is a good look at the segregated South. Strickland's illustrations compliment the text beautifully with a commitment to detail. This is an excellent title to be used for African-American history month, Civil Rights curriculum, and as a read-aloud for younger students. Michael's determination and imaginativeness are evident in Strickland'spale mixed-media paintings, which make excellent use of outlines to portray the boy's imaginings. Inspirational in tone, this is a strong introduction for young listeners and readers to the American Civil Rights movement. Strickland’s illustrations compliment the text beautifully with a commitment to detail. Textually and visually, this title simply comes together very well.